According to numerous reports, U.S. authorities today alerted a number of Middle Eastern and African airlines that starting soon, their passengers will have to check any electronic items larger than a cell phone. That means passengers on these flights will have to put their laptops, tablets, Kindles and portable game consoles into their checked baggage for the foreseeable future. 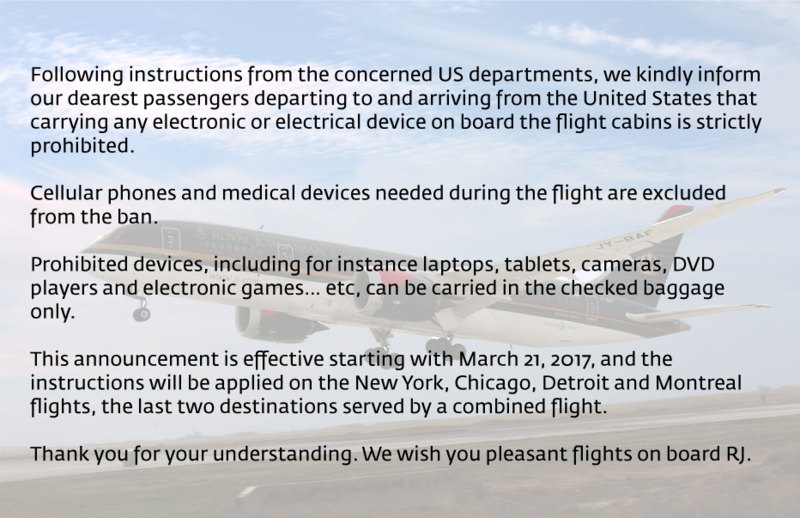 Update (3/21): U.S. officials have now confirmed this electronics ban. It affects ten airports in eight majority-Muslim countries. You can read about the new details here. There is still a lot of confusion around this ban. It’s unclear which countries and airlines are actually affected by this, for example. CNN’s Jon Ostrower reports that more than a dozen airlines are affected by these new procedures, but it’s unclear which airlines we’re actually talking about. So far, only Royal Jordanian Airlines has tweeted about (and subsequently deleted its message). None of the larger Middle Eastern airlines like Emirates have yet commented on this laptop ban. We have contacted a number of airlines that are potentially affected by this but have not received any responses yet. The Qatar Airways booking agent I talked to was clearly unaware of any potential electronics ban on her airline, for example. Update: Saudia has now also confirmed this ban on large electronic devices. Royal Jordanian’s statement from Twitter before it was deleted. It’s also unclear for how long this ban will remain in effect. While early reports suggested that this was a 96-hour ban, it now looks like the airlines will have 96 hours to comply with this order. The reason for this order, which the Guardian reports came from the TSA, is also unclear. Chances are, though, that it is in reaction to what the U.S. deems a credible and imminent terrorist threat. Given that most airlines forbid passengers from checking into the cargo hold anything that’s powered by a lithium-ion battery, this is a pretty perplexing decision. This either means that passengers who are flying on these airlines will now be able to check in these devices or won’t be able to travel with them at all.